Stranger Things Season 2 to End on a Huge Cliffhanger? While walking the Emmy red carpet last night, Stranger Things creators Matt and Ross Duffer revealed some interesting details about the highly-anticipated Stranger Things Season 2. Very little is known about the season as a whole thus far, but Ross Duffer was asked on the red carpet to rate the finale on a scale of 1 to 10, in terms of how much of a cliffhanger there will be. Here's what Ross Duffer tried to say, playing it safe without giving a real answer. "It wraps up very nicely. I think that people will feel satisfied. There is a hint of what is to come, but... what else can I say?" Matt Duffer added that the interviewer from TV Line asked for a rating on a "cliffhanger scale" from 1 to 10, which Ross didn't ultimately provide in his answer. Matt Duffer then confirmed that the Season 2 cliffhanger is a 7 out of 10 on this scale, which is certainly bigger than maybe some fans expected. Naturally, they wouldn't divulge any details about the season finale cliffhanger, but they did talk about the return of Eleven, played by breakout star and Emmy nominee Millie Bobby Brown. Here's what Ross Duffer had to say about how Eleven's journey is much different than most fans will expect. "I don't know what I want to say, but I will say that I think that her journey this season is a lot different than what people are going to expect, but we're excited about it. We knew Millie was good when we cast her, but she blew us away, just like everyone else, in Season 1. We really wanted to put her on an emotional roller coaster this year, and she knocks it out of the park." Matt Duffer added that Eleven has hair this season and she can actually complete sentences, and that it's always fun to write for Millie Bobby Brown. Unfortunately, the Stranger Things creators wouldn't divulge any details about a potential romance between Eleven and any of the young boys in Hawkins, Indiana, but they did talk more about the late Barb, the beloved character played by Shannon Purser who suffered a brutal death in the first season. Ross Duffer confirmed that she is still dead, and there will be no flashbacks, but people will still be talking about Barb and there will be "Justice for Barb." "No, we love Shannon, she's incredible, but Barb is dead, no flashbacks to Barb, but her spirit lives on. There is plenty of Barb talk throughout the season, because she left a hole both with her family, and Nancy too. You know, the Byers' got Will back, but they (Barb's family) didn't get their daughter back, so we sort of see the repercussions of that." Last month, Ross Duffer revealed in an interview that he thinks the show will come to an end with Stranger Things Season 4, while teasing that Season 3 has been confirmed. While the Duffers wouldn't confirm that the show will end in Season 4, Matt Duffer revealed that they know where they want to end the show, but they don't know exactly how long it will take to get there. He did add, though, that he doesn't want it to go on that long, because he doesn't think, "this story line was built to sustain too many seasons." He teased that he definitely doesn't want to see it get to a sixth season, adding that it "may be four, may be five, who knows." The hit series took home five awards at the Creative Arts Emmys earlier this month, including wins for Best Title Design, Theme Music and Casting, the hit series was shut out of the main awards last night. 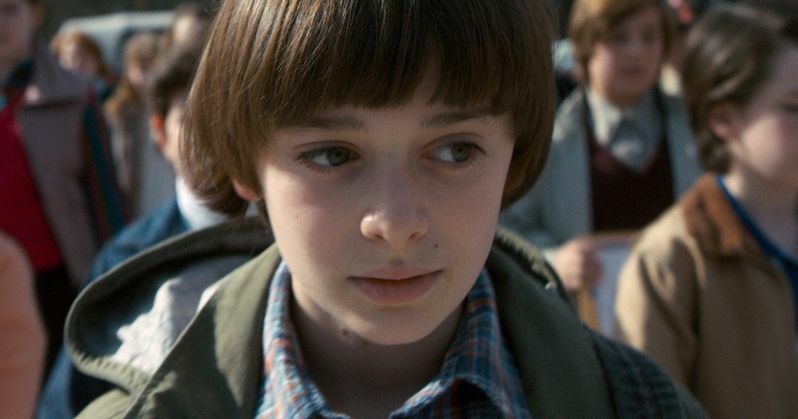 The cast includes Finn Wolfhard (Mike Wheeler), Millie Bobby Brown (Eleven), Gaten Matarazzo (Dustin Henderson), Caleb McLaughlin (Lucas Sinclair), Natalia Dyer (Nancy Wheeler) and Charlie Heaton (Jonathan Byers). Winona Ryder will also be back as Joyce Byers and David Harbour will also be returning as Sheriff Hopper. Take a look at TV Line's video interview with the Duffer Brothers from the Emmy Awards red carpet.